KVH’s rugged 60 cm (24 inch) TracVision® HD7 antenna is a breakthrough in marine satellite TV design. The system simultaneously tracks DIRECTV’s Ka- and Ku-band satellites so you receive high-definition programming from DIRECTV on your boat or yacht exactly the way you enjoy it at home. 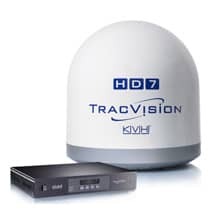 KVH’s exclusive TriAD™ technology, enables the TracVision HD7 antenna to receive broadcasts from all three DIRECTV satellites at once so that everyone onboard can watch the channel they want, on whatever TV they want, whenever they want! Never again wait through lengthy satellite searches or be limited to the content from just one satellite at a time.